This year, they were being held on this side of the Atlantic, starting with a Friday lunch at the Leahy ECHO Center on the Burlington Waterfront and continuing over the weekend in Stowe. If he'd agree to it, would Columnist Freyne be interested in a little one-on-one interview with David Trimble? Pinch me. Is this a dream? The leader of the Ulster Unionist Party in the Six Counties of Northern Ireland who I watched "religiously" on the TV news during the 1990s? The Protestant who shared the 1998 Nobel Peace Prize with Catholic John Hume, leader of the Social Democratic and Labour Party? 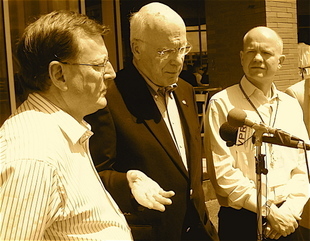 That's Trimble on the left, during the little stand-up presser he, St. Patrick, Conservative William Hague MP, and Sen. Thad Cochran of Mississippi [who I cropped out for space], participated in after lunch on the Burlington Waterfront outside of ECHO. And after the presser, Trimble was kind enough to peel off with yours truly for a private, up-close-and-personal, one-on-one along the lakefront. 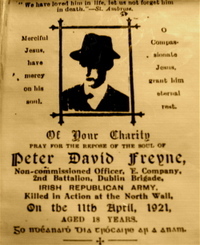 As some of you know, the Peter Freyne I'm named after, Uncle Peter, was 18 and a member of the Irish Republican Army's Dublin Brigade in April 1921 when he got his head blown off during an IRA attack on the H.Q. of the Black & Tans on Dublin's North Wall. Frank Freyne, the older brother who led that raid, was captured six weeks later in May as he was departing the Dublin Customs House, a huge structure he and more than 100 of his IRA colleagues had just successfully torched. A little over six months later, the December truce between the IRA and Winston Churchill established the Irish Free State. That peace treaty saved Dear Old Dad from the execution he was awaiting in an unheated cell in Kilmainham Gaol [now a major tourist attraction]. You might say, it was also a factor in my being here today to write this. FREYNE: Do you think of yourself as Irish? In terms of my political national identity, I’m British. The British concept is capable of embracing all the people within the British Isles. That’s where it comes from. Unfortunately, we have some people in the British Isles who've been determined to say they’re different and separate and don’t want to be the same as everybody else. They now form a separate state called the ‘Irish Republic.’ And if that’s what they want to do, fine. That’s okay. I think they’ve made a mistake, but there we are.